If I called the shots on Nivea Slidefest, I'd say that there's only one rule. And that rule is to not go alone. Because it's so fun you will constantly think of so many people whom you should have brought along with you! 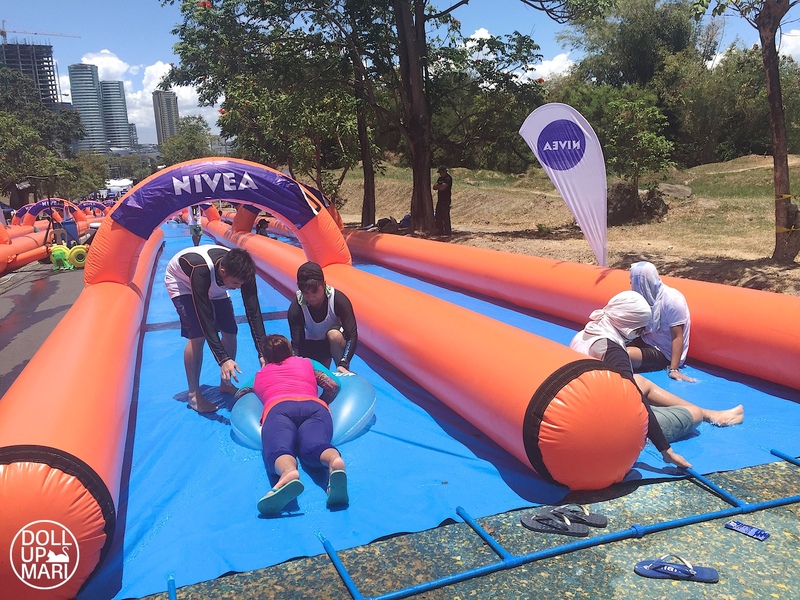 That was exactly what happened to me yesterday when I went to Nivea Slidefest 2016. So this year, they held it in Filinvest City. 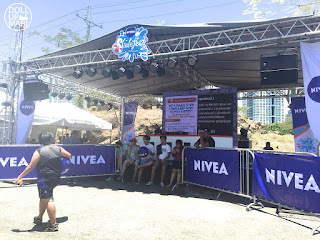 Last year, they held it in Subic. 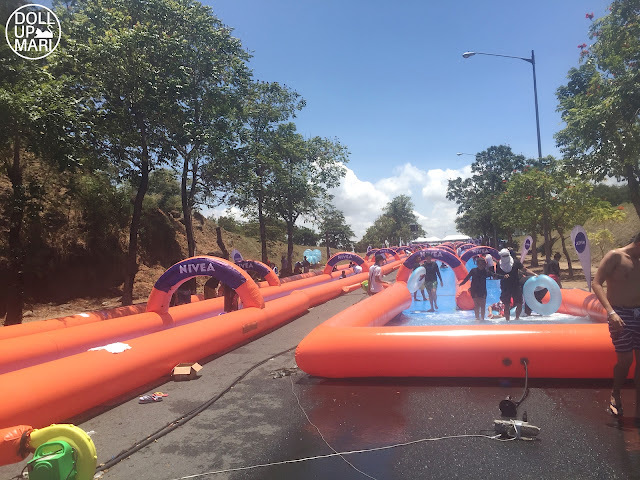 And what is Slidefest? It's a family friendly experience where you ride on a lifesaver and slide down a suuuper long inflatable slide, with foam squirting out if you want to! 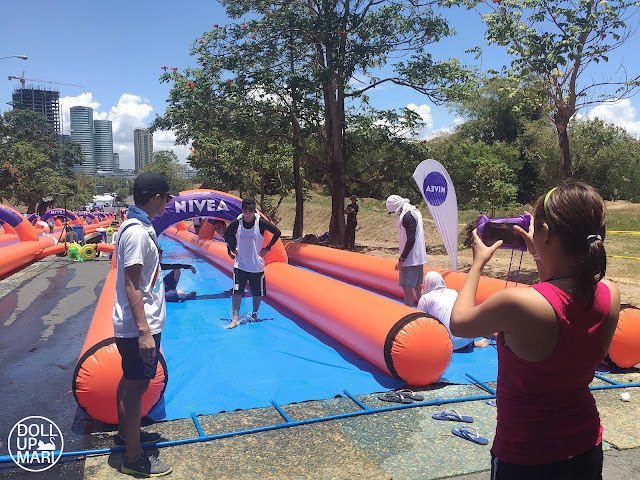 The reason why the areas where they hold this event are so far flung is because the slide has about a 15-20 degree incline. 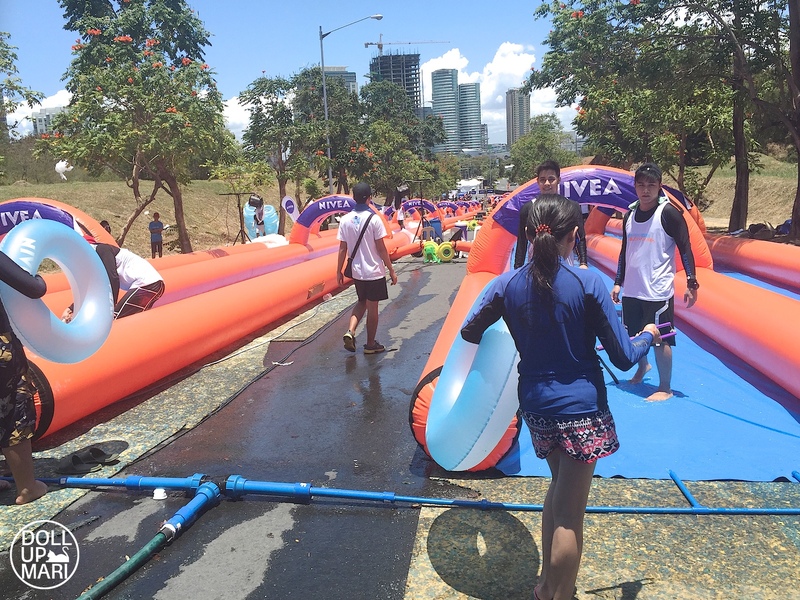 It can't be flat because the water on the slide cannot propel people properly. 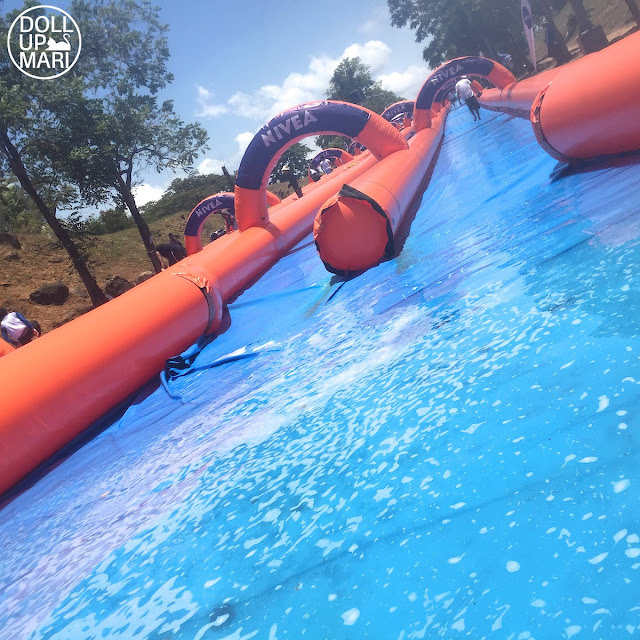 It also can't be too steep as the trip down would be too fast and it'd be too short for the people, or could possibly cause friction burns as you rub against the slide's surface. I initially thought that this was flat and wondered why they couldn't make this in a BGC field or in MOA Concert grounds instead. Well, now I know. There were bloggers at the event for Slidefest itself, and there were bloggers for Nivea, as this is co-presented by Nivea. And yaaay! I was one of them! 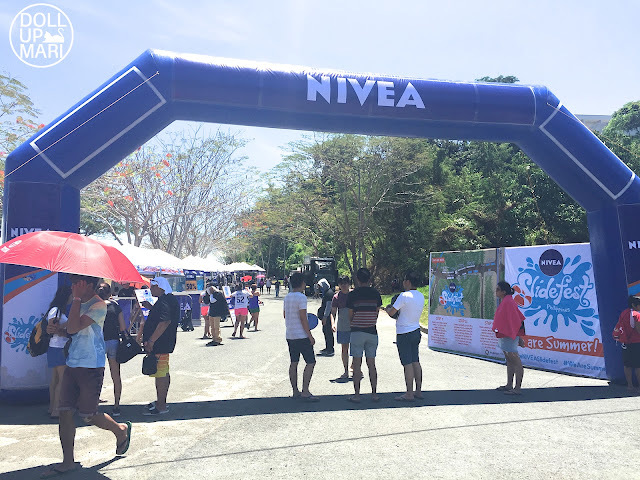 I brought my Nivea Sun Protect and Light Feel sun spray with me and took it to the ultimate sun test. And before coming to the event I already applied my Nivea sun Whitening SPF50 lotion. This was my tactic because I wanted to make sure I had a thick enough layer of sunscreen as possible so that it wouldn't wear off no matter what. And yes, I went alone, which is super sad! I asked the staff to take this photo of me as I wasn't with anyone. I really wish my family could've gone with me as it's a unique and a super fun experience. I am also super stressed out all the time, so doing something fun and relaxing for a change was a big help to my sanity. I think I'll already apologize in advance if this is not the typical cool girl tier 1 blogger kind of photos. Bwhahahahaha. 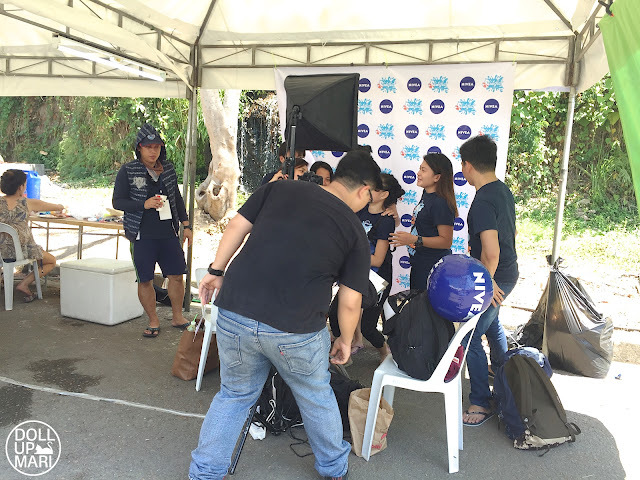 Prior to coming to the event, I had a lot of questions in mind about the logistics, provisions for guests, and others. But upon googling, almost all the internet content focuses just on how fun the slide is and that the whole family should go there. So I decided to take a lot of photos of every single aspect of it (whether it's glamorous or not!) so you can discern how you'd book your trip to the future Slidefests! So this is the entrance area. From here on it's just tents and tents and tents. This seems to be a real road that they just closed down for the event. 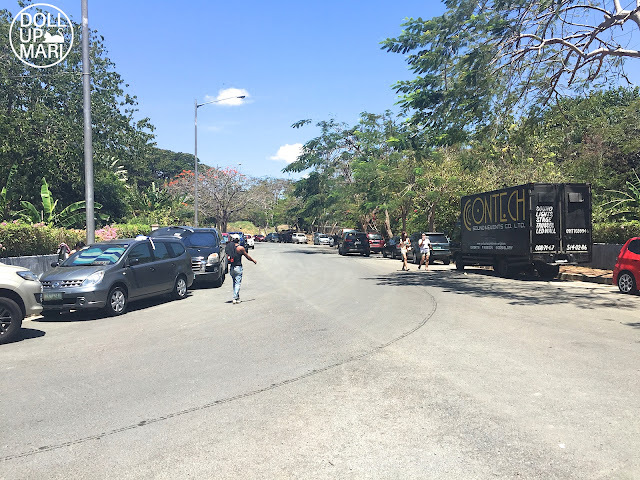 I rarely go to Filinvest, and each time I go, it's probably spaced five years apart so I am oblivious to all the new developments hahahaha. 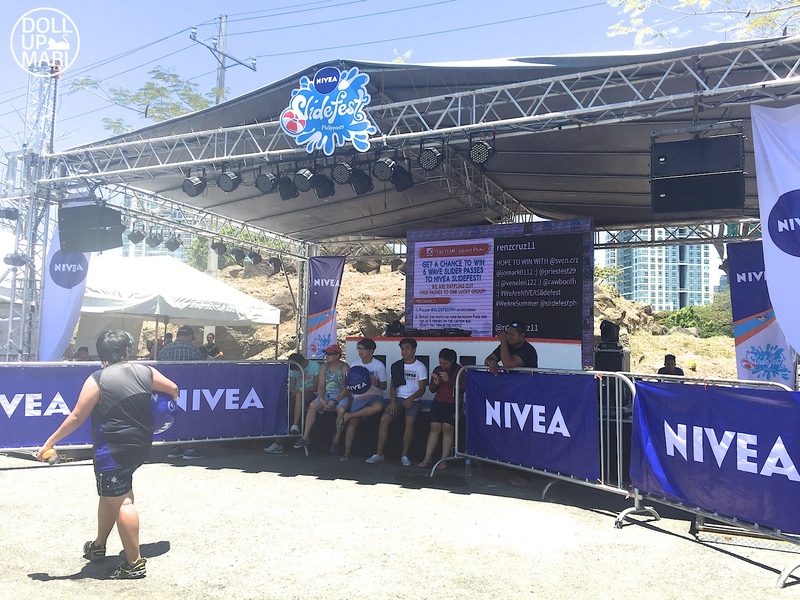 Just to give an idea, this is how it looks like outside the venue. I think parking was relatively OK, but you have to walk a short distance to the venue. Upon arriving, I proceed to the registration booth. 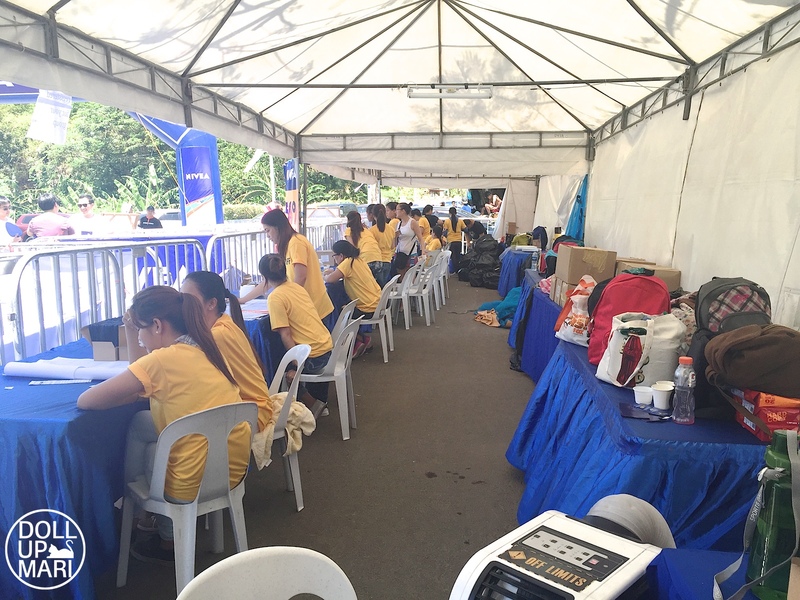 They have a lot of registration booths as the event also has a lot of kinds of tickets and passes. Here in the press booth there are nonstop inflations of beach balls. I was so happy to receive a beach ball, too! This is how much registration is going on as this is the view of all the registration booths. I was told that most sliders prefer to go there early in the morning at 8AM, and the other bulk likes to go there after the sun sets as the slides are open till 8PM. I got here at 11AM, and of course, the sunlight was already super strong, so there weren't a lot of people registering at this time. They don't allow food, which is why they have all these booths for food and beverage. But honestly, no one really checked my bag. I had a bottle of water in it and no one confiscated it. I think in general it's easier to just buy food on the spot so that it's freshly cooked and less prone to spoilage compared to leaving your foods in the baggage counter. But as for beverage, I don't think anyone really has the right to prohibit beverages as it's just so hot. I ended up consuming my bottle of water and buying another bottle of water in the event and buying a 1L melon shake, too. 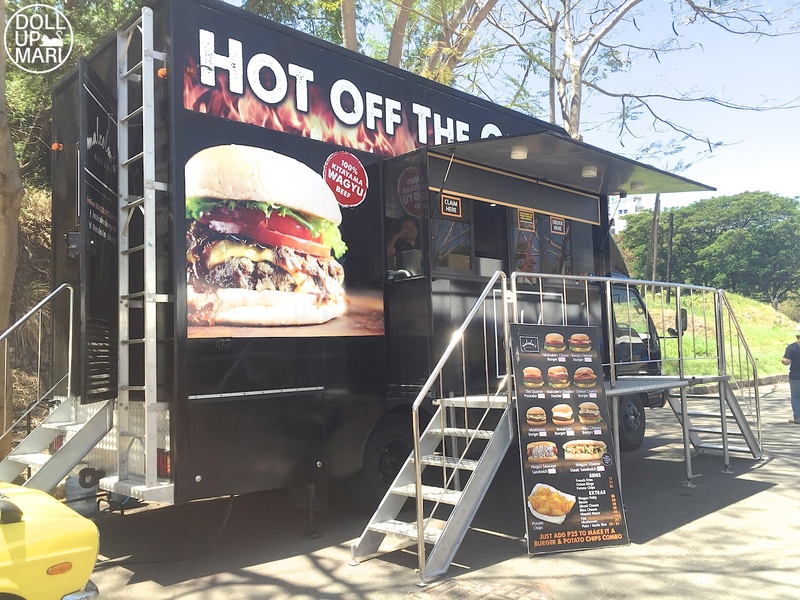 For this year's Slidefest, there was a burger truck, bagnet booth, churros booth, grilled foods booth, and fruit shake booth among others. 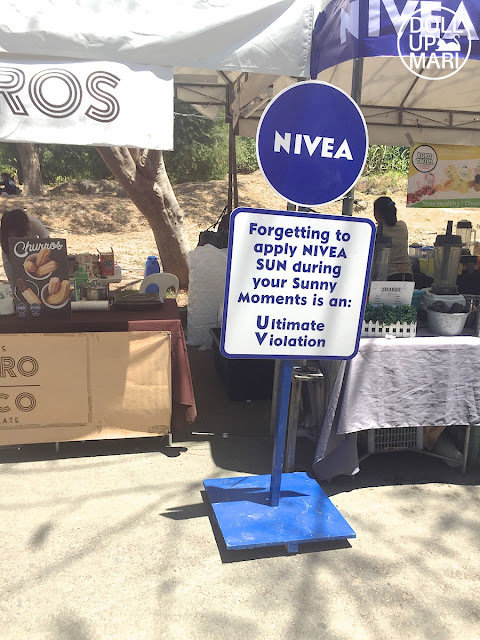 Throughout the venue there were a lot of cutesy reminders from Nivea like this one. 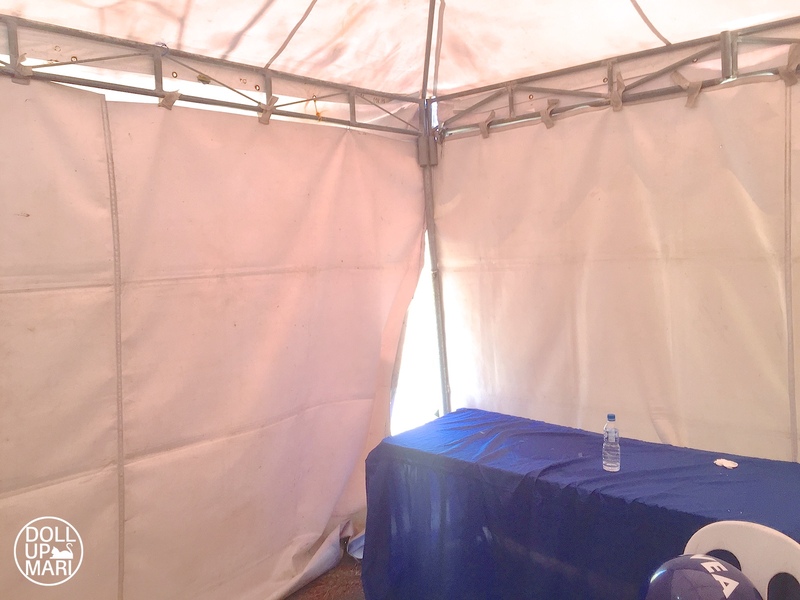 They is a waiting area with tables so that you can eat and drink while seated and under a tent. There were probably 30 tables in this area, but despite that, there were a lot of people. 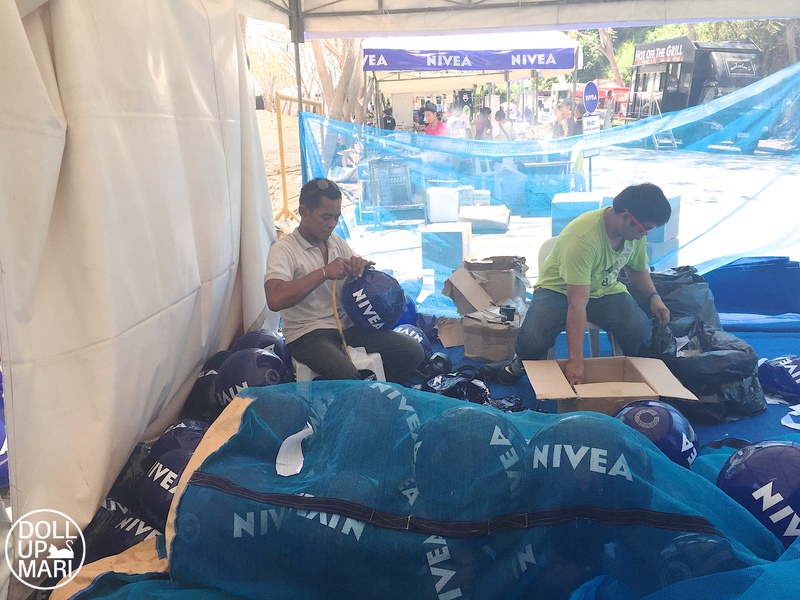 And of course, there's a Nivea sale booth! I just had to buy new deodorant as the deal is just too good! In here they had deodorants, suncare products and men's deodorants for sale. 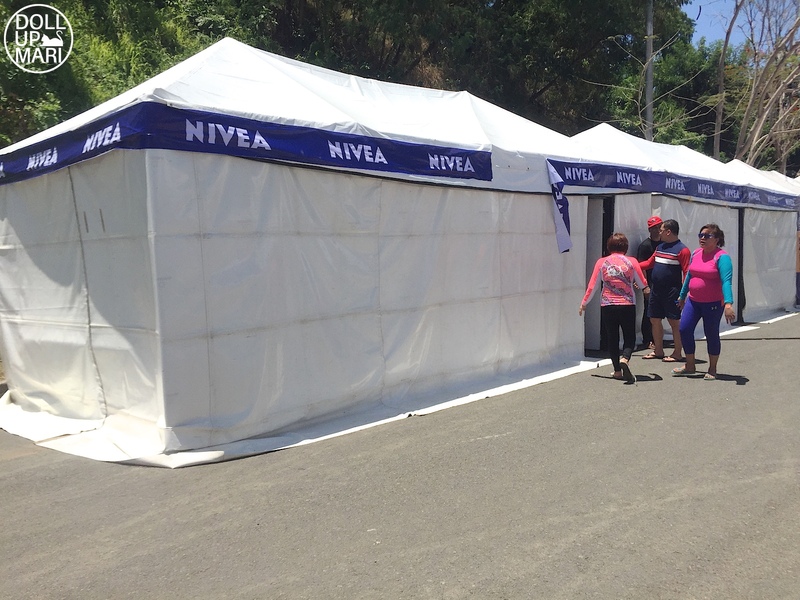 Since this is a pop up booth, they didn't have the usual lineup of lotions, bar soaps, and creams. There were also no baby products. I didn't need to buy any sun products today as they sent me a generous loot bag full of their sun products! 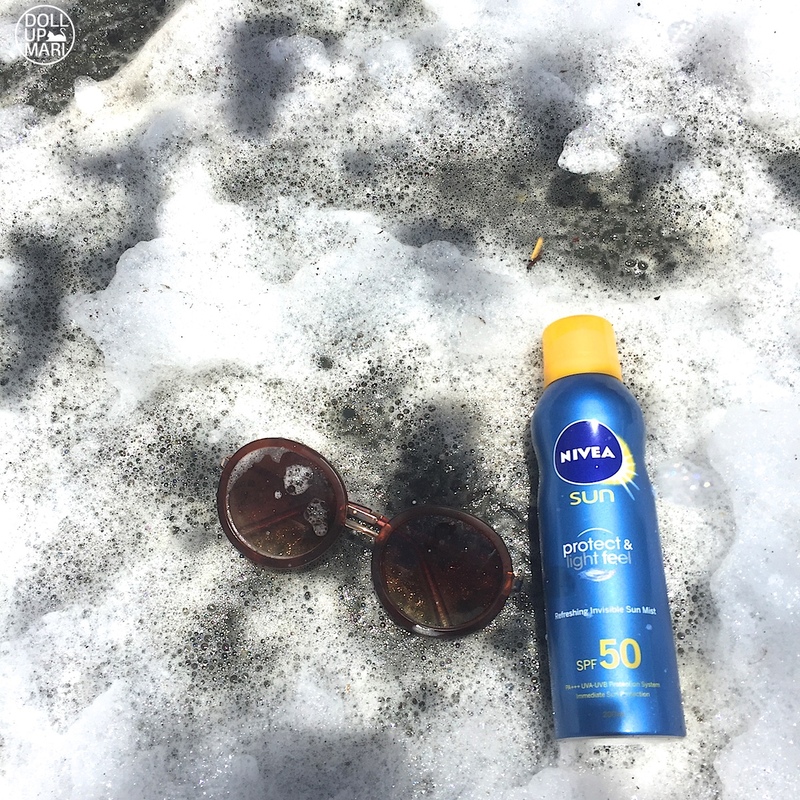 I brought with me my protect and light feel sun spray as well as my after sun cooling mist. And for those who are wondering, there is a fully shaded rest area for VIP pass holders. It's kinda like the rest/eating area, but it's fully closed and shaded. I'm not exactly sure if it's a good idea to hang out here for too long as there's no source of wind inside. 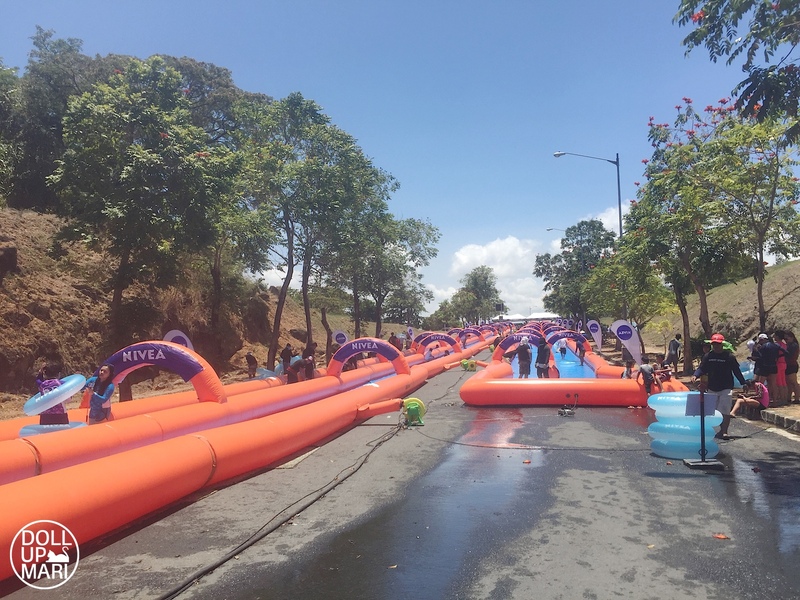 I have no idea what exactly transpired in last year's Slidefest, but I think they expanded the idea and made a whole lot of spinoff activities this year. 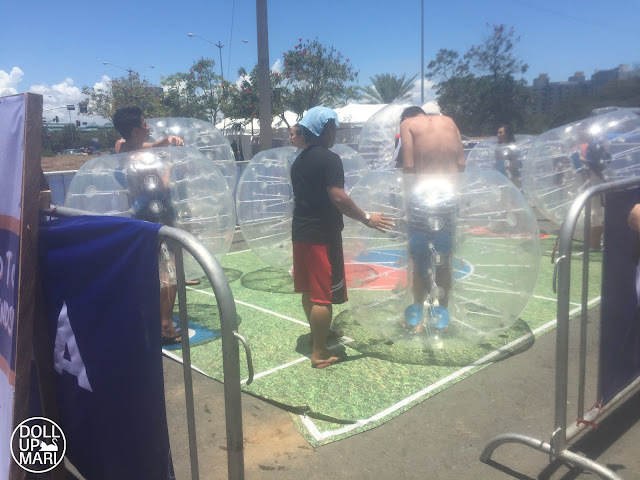 They have an inflatable obstacle course like this one, and inflatable sumo, and when I was leaving I saw fire dancers come in with their equipment. I heard that there were concerts and DJ-ing and lots of entertainment that ensued after I left. And I think it's worth clarifying now that they have a changing room and a shower area, not a shower room. I did see information on the internet that there are showers in the venue, and while there are showers, it's really just a whole line of pipes right beside the slide in order for guests to rinse themselves afterwards. It's like the typical shower fixtures you see right beside swimming pools. The showers are not enclosed in any manner, so you cannot take a legit bath in them. I brought shampoo and just asked them if I could use the shower area, so I shampooed and soaped my body with my bathing suit on. And then I walked to the changing area (which is probably a two minute walk). 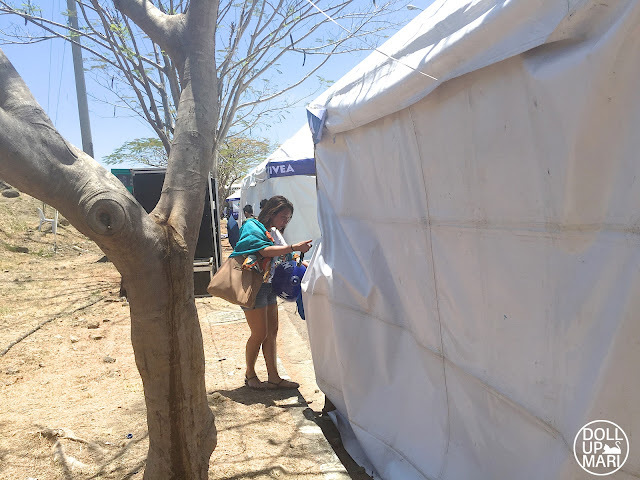 Their changing area is a loooong conjunction of tents with velcro fastening the tarpaulin panels. It's really just an honor system kind of thing as you will not have an idea if there is a person inside the booth or not, and there is no supervisor monitoring as to who is changing and who isn't. You need to peek at the slit first before going in. This is how it looks like. Each room more or less has a table and a chair. Between each tent is a piece of cloth, and the only effective way to go in is through this slit. And for those who are wanting to know, yes, they do have a baggage area. I was honestly wondering as to how I'd slide with my things, so I brought a waterproof backpack with me and errthing. But thankfully, they have a booth, so you only need to perhaps bring your sunscreen or camera, or whatever matters. They do have a warning on the website that they will not be responsible for any losses, so I think it's helpful if you just bring enough cash for the day and skip the gadgets you won't really need while sliding. The baggage area is quite expansive, and I think it helps that there are a lot of staff employed and the ratio between staff to bags isn't so big, so you can more or less ensure that the staff remembers you and your bag. They also give out number stubs, but thankfully, due to their level of attention, perhaps the incidence of someone claiming the bag of another person through a lost stub is low. 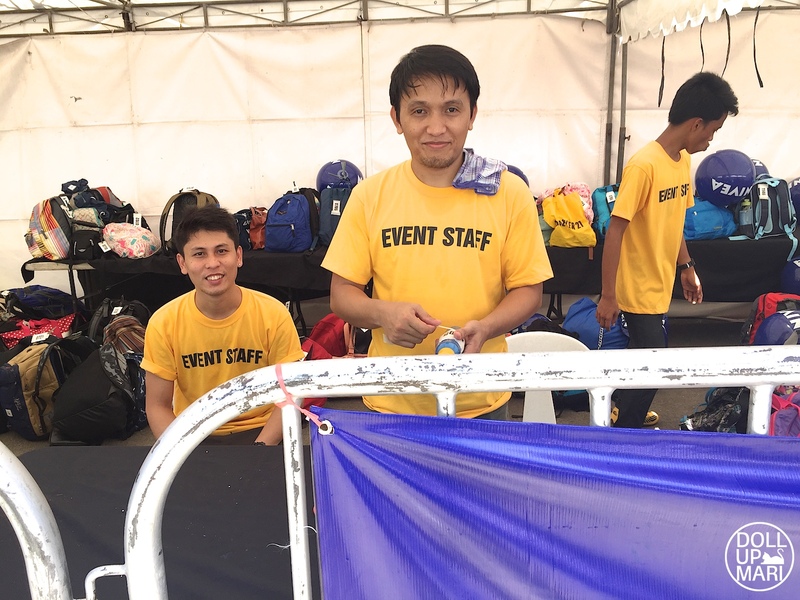 Thank you staff for safeguarding my things while I was having fun! And yes, here comes yet another unglamorous photo. They have portalets for males and females, but it really is just for doing business. The portalets are not for showering in. So yes, if you plan to shower, unless they change their logistics formats, expect to shower in your bathing suit bwahahha. There is an uphill walk towards the slide as the slide is from an incline. 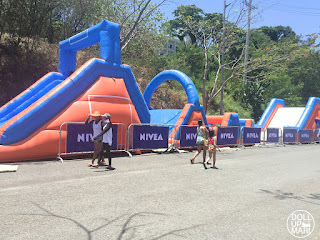 I really thought that it was flat until I saw the signage and saw that it was an uphill walk to the slides. And finally, this is the slide area. I was told that they only had two slides last year, so it's nice that they now have four slides this year! 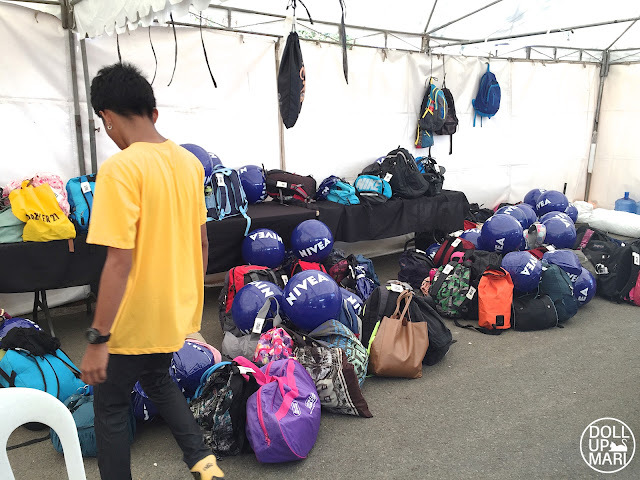 There were a lot of people who brought Go Pro's or secured their phones in waterproof pouches. Everyone has a different story to tell. And everyone really will want to tell their own stories as the experience is super special and unique! 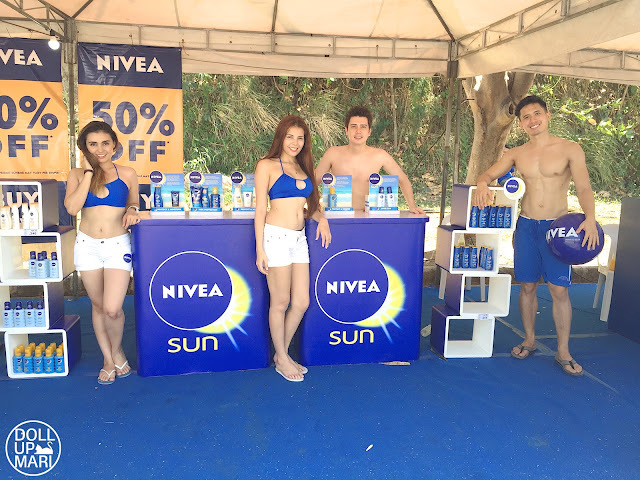 This is me posing with my sunscreen and this Nivea lifesaver. I made sure to take sunscreen along with me so I can spray often. 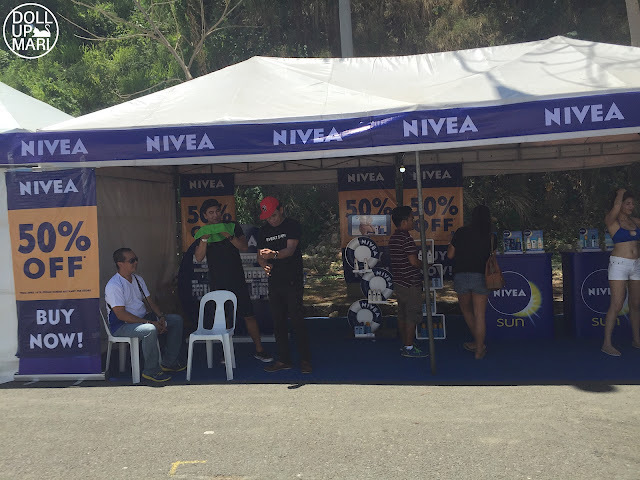 I ended up spraying this product on other event goers as well as there were quite a lot of people who stared at me and my sunscreen hahaha. Most of the people had cameras, and the others simply went down the slide without anything. And then here's me with my sunscreen. I super enjoyed using this product as it's lightweight and easy absorbing. 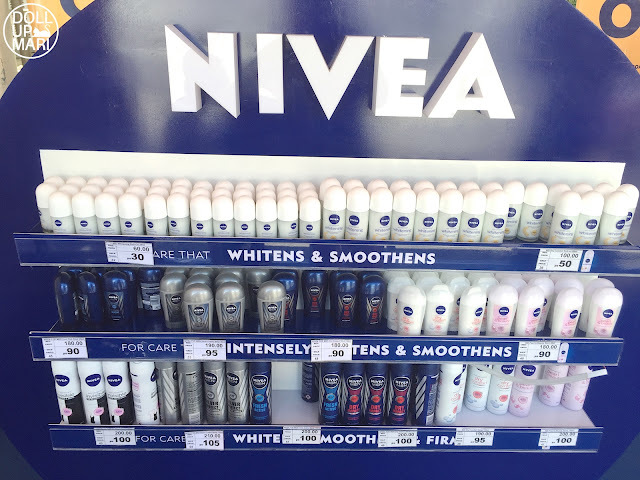 It was sooo hot yesterday, more so during the time that I went, that it was nice to use this product in particular as it didn't feel heavy on the skin. This product also ended up being the perfect choice because when you slide down you don't get completely submerged in water. You get wet because you're sliding on a wet surface with a constant stream of water, but you're not submerged. This worked because it was the right kind of lightweight. Heavier lotions are compensated for by being submerged in water as the water cools the skin, and are also needed for the situation as the water is also bound to wash off some of the product. This was lightweight enough and had enough staying power and protection for a situation like this where there is little water involved. In order to go down the slide there are assistants who pull your arms and propel you down the slide. And you will be on your belly on the slide as the lifesavers are not deep enough for one to sit properly in. As a result, your face will bump to the sides of the slides pretty often as your lifesaver rotates on your drip down. The slide is just inflated so it's soft and there isn't much of a problem, but it helps to have sunglasses on as they shield the eyes from the slide. I do recommend people to go during the less hotter times as the ground, and subsequently the slide surface, get hotter, too. Unless you boast of 6 pack abs, your tummy is bound to hit the surface of the slide, and it may feel hot at times. 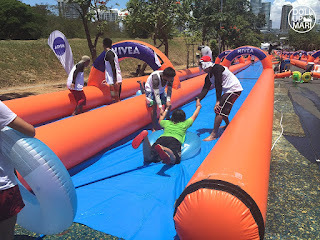 You may also want to wear a rash guard as it helps to make your arms more "slippery" so you can slide better even when your arms hit the sides of the slide. It's a super amusing experience because there are so few places where one can slide on such a big scale, more so for adults! I've seen a lot of pool slides, but they're usually small slides for small children. This one, thankfully, is so large in scale that you can relive your childhood here! I actually saw a lot of small children, mostly expat children, having a great time. It's a magical experience and you really just have to be in the event itself to feel the magic. I really wish that I had friends with me here as it's super fun. And my brother, too. And here is a time lapse GIF to show all the action! This is how it looks like from below. 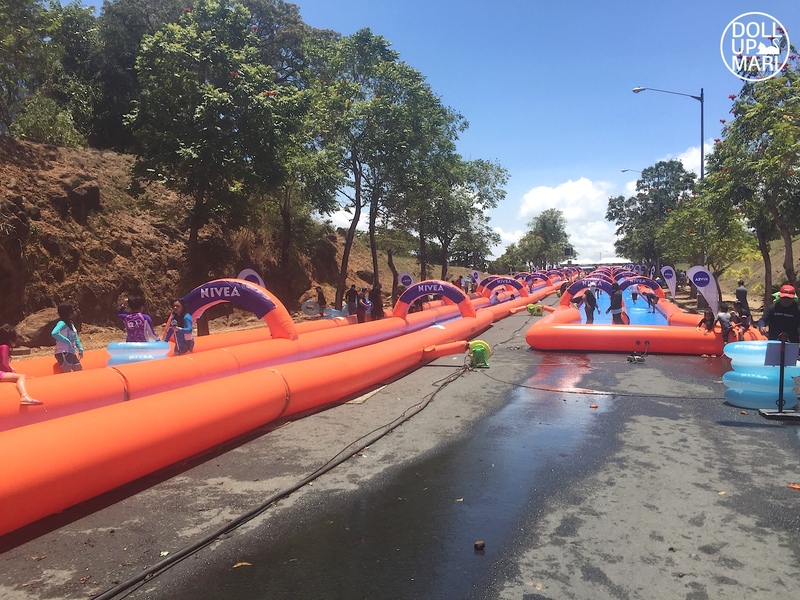 The water slide is longer than the foam slide, perhaps because making a super long foam slide will entail much more foam machines than the usual. I tried both slides once, and it was already lunch break hahaha. I didn't mind as I didn't intend to stay too long as I still had a lot of business to do back at home. I was just glad to have experienced how it's like on the slide. And this is the sumo thing I was talking about! I'm not exactly sure what the formal name is or what game this actually is, but it looked like a sumo game to me. And since this is slidefest, do know that there will be many foam machines throughout the venue! 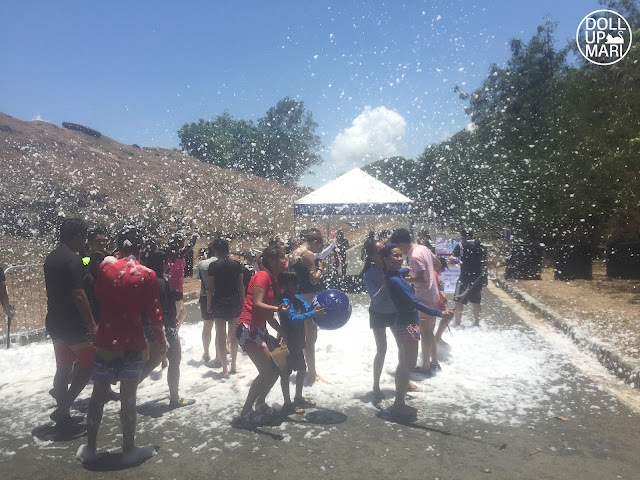 It was so nice to see people enjoying themselves in the foam. They do have a photo area! There are photographers ride beside the slide taking photos of the people going down, and you can get a photo for Php350. 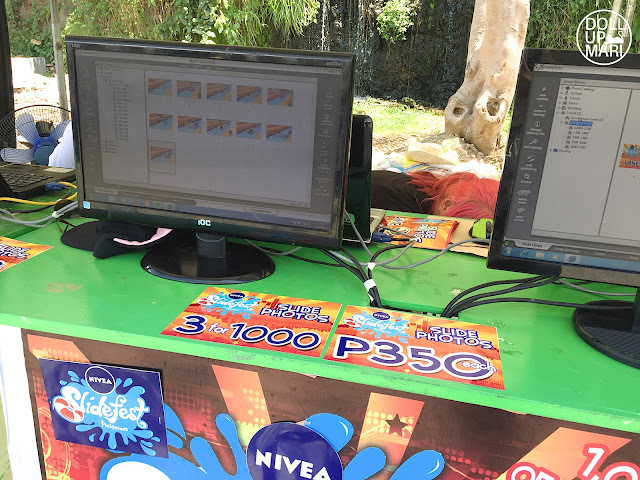 You can get three photos for Php1000. So that's it for this year's Slidefest! I hope to go to the future Slidefests, but with more people with me hahaha.